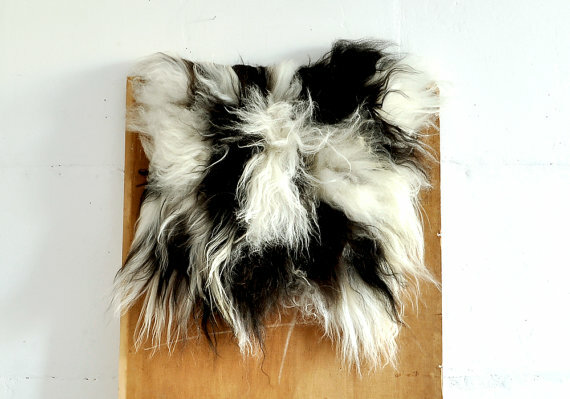 I’ve always admired this wool wall hanging in my friend’s apartment. She has the greatest taste and I was sure it cost a fortune … but it turns out she made it herself! I don’t consider myself super crafty but my friend Amanda ensured me that if she could make it, anyone could make it, so on a rainy Sunday afternoon I headed over to her place to give the project a try. 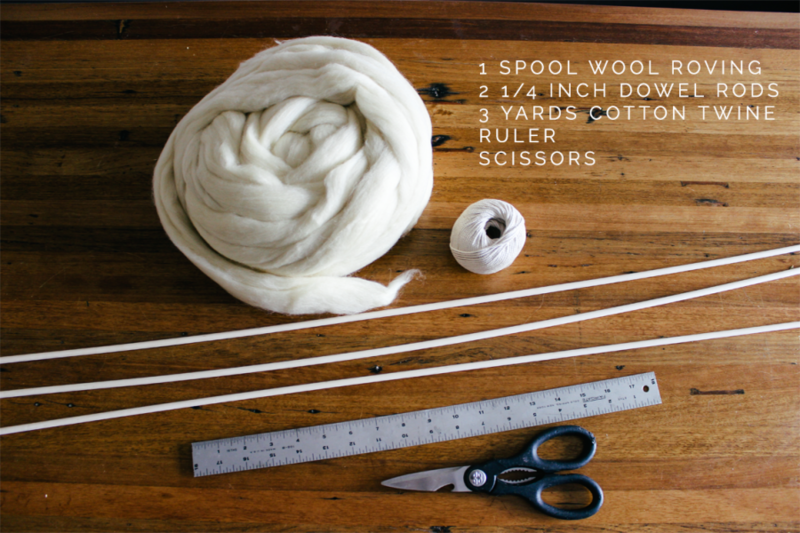 The spool of wool roving is more than enough for 2 wall hangings so it’s the perfect project to do with a friend. 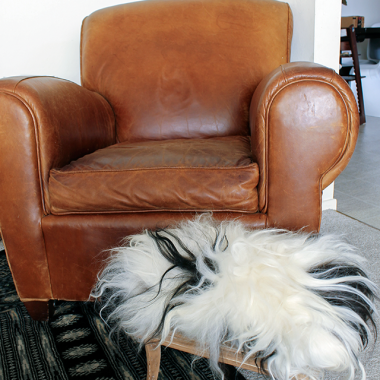 I choose undyed because I liked the natural look, but you can also choose a color (or a few!) if that’s more your style. My local crafting stores didn’t carry wool roving so I ordered it from Etsy shop FiberFeltnMore. The shop owner, Anna, was so sweet to offer our readers 5% off all orders with code COPYCATCHIC. I picked up the dowel rods at Home Depot and already had cotton twine lying around at home, but that can be found at Amazon or probably any craft store. Overall this project was much easier than I anticipated. It’s helpful if you make your cuts as straight as possible so that you don’t go crazy trying to even out the layers later (or is that just the perfectionist in me!?). 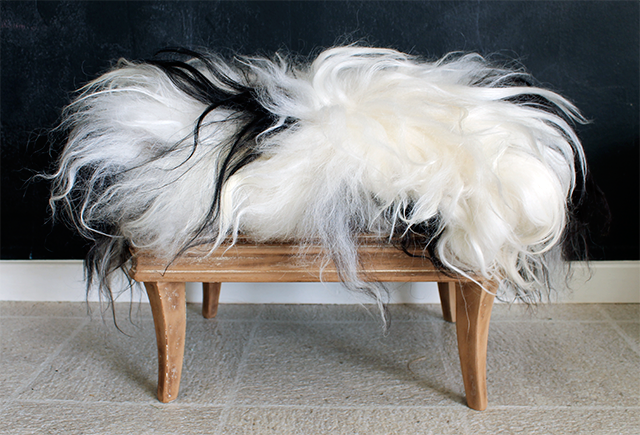 Be prepared for a lot of shedding as you work, but once it’s made and hanging, that should stop. 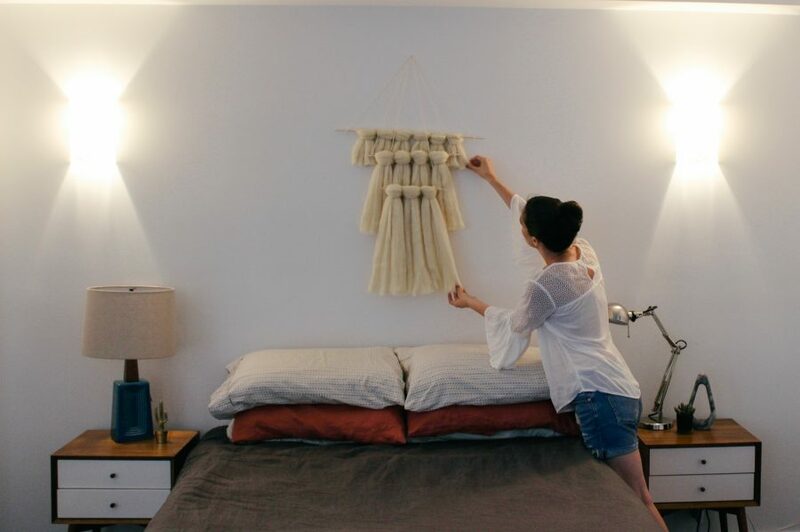 At under $20 this project is well worth flexing your creative muscles! 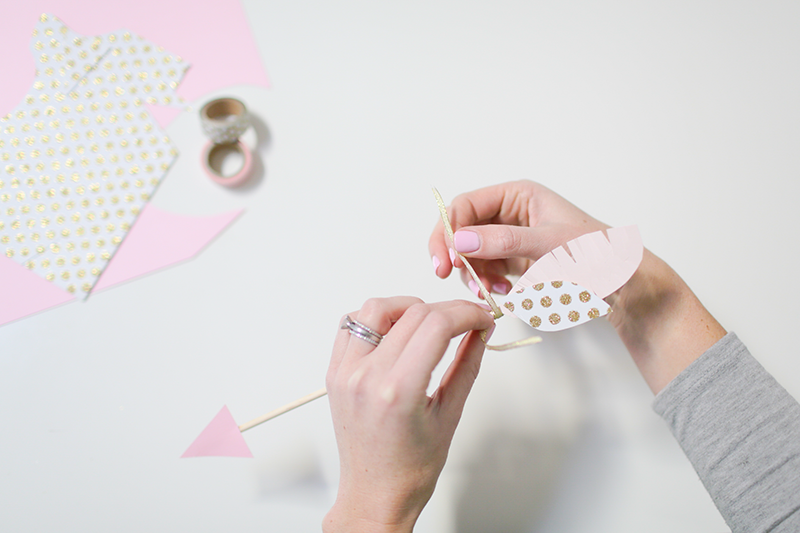 If you give this project a try, be sure to share the photo with us in the comments or tag @copycatchic. I can’t wait to see how yours turns out! 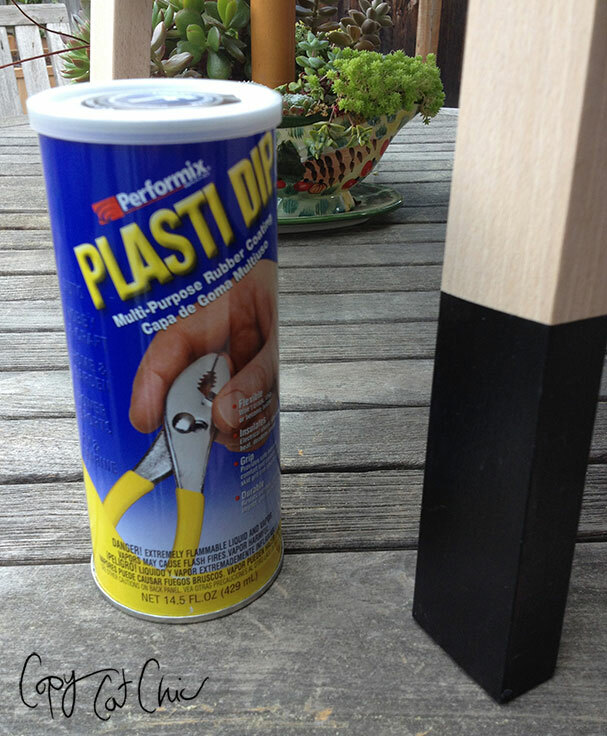 1 | Cut your dowel rods down to size. I wasn’t sure scissors could get the job done but after a few seconds of scouring, the dowel rods easily snapped! You may want to sand down the ends if they are rough. 2 | Cut your wool down to size. 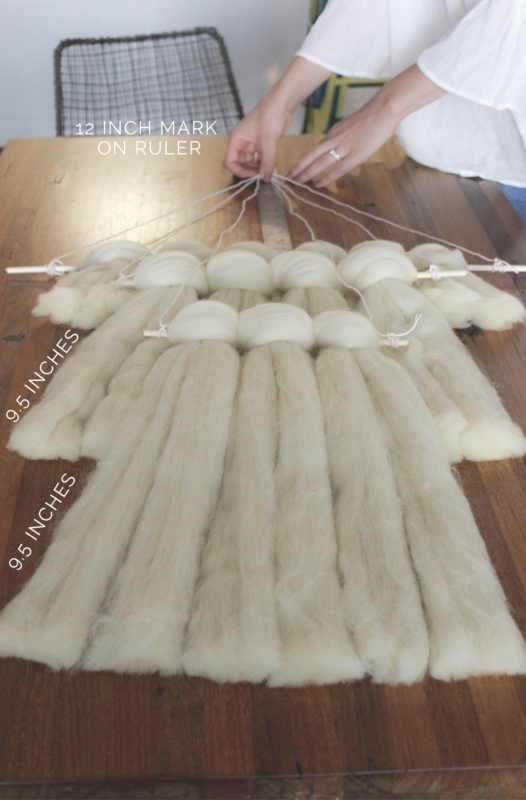 3 | Attach the longest wool (44 inches) onto the shortest dowel rod (10 inches). 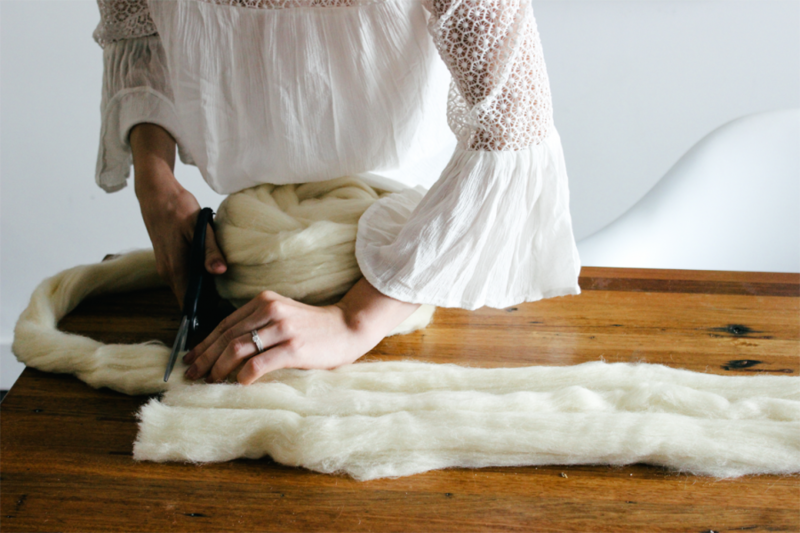 Working one at a time, fold a piece of the 44 inch wool in half and place it on top of the 10 inch rod, leaving a little space at the top. 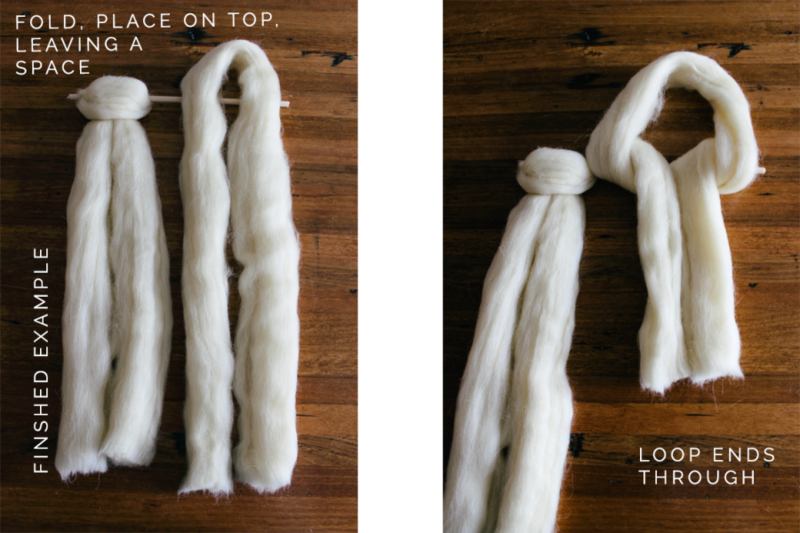 Loop the bottom of the wool through the space you left at the top, creating a loose knot around the rod. 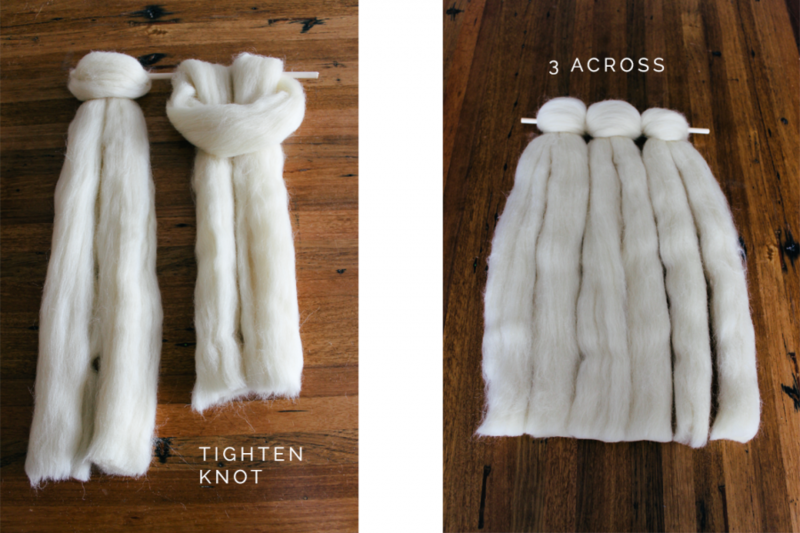 Tighten and fluff the knot. Add the remaining 44 inch wools to the 10 inch dowel rod until it has 3 across. 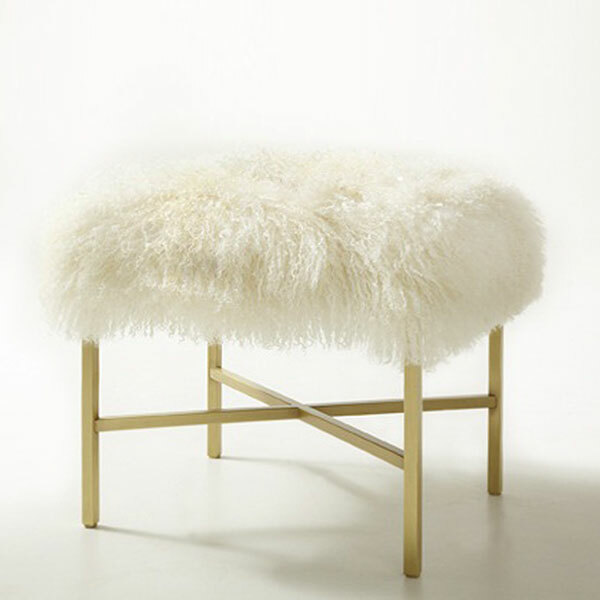 4 | Attach the medium wool (32 inches) onto the medium dowel rod (15 inches). 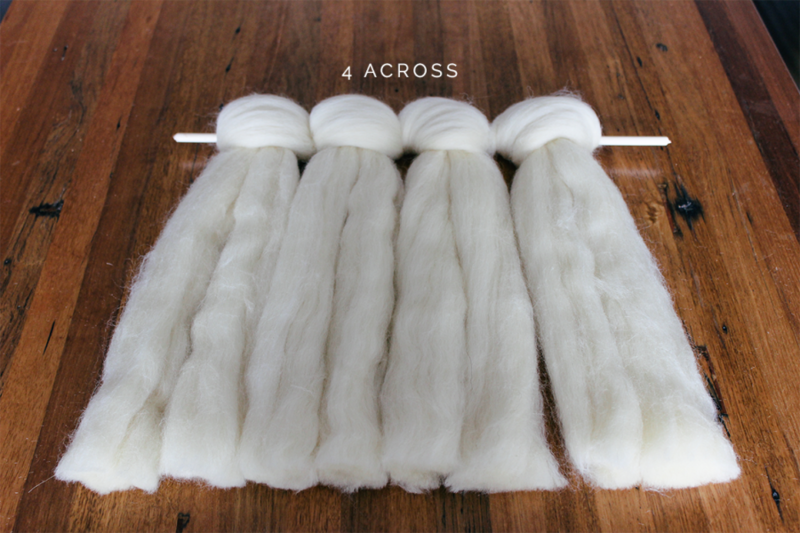 Using the same process as step 3, knot the wool until there are 4 across. 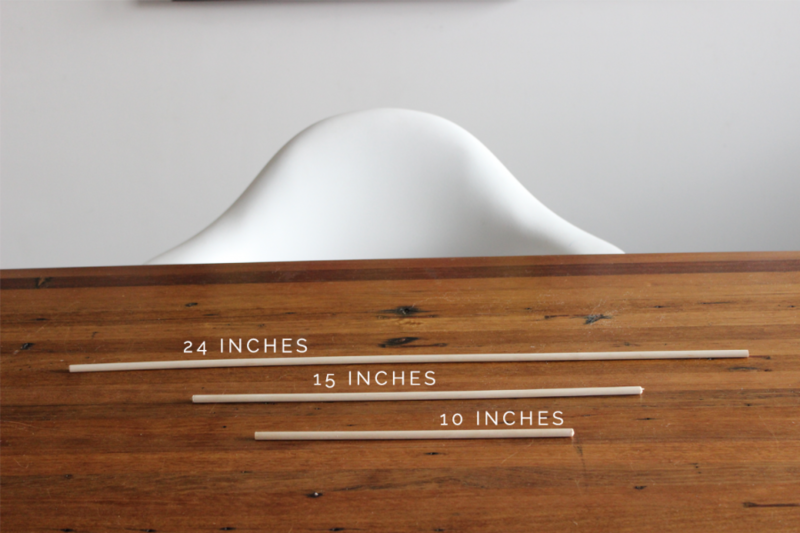 5 | Attach the shortest wool (16 inches) onto the longest dowel rod (24 inches). 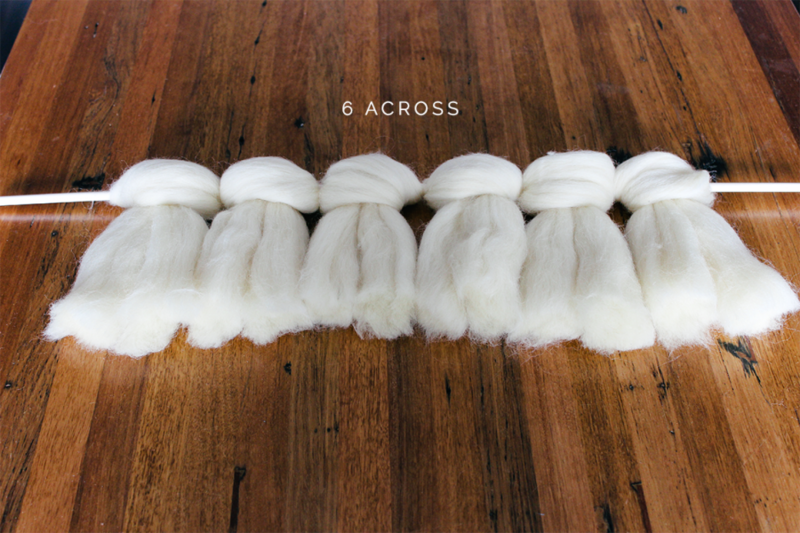 Using the same process as step 3, knot the wool until there are 6 across. 6 | Arrange on a flat surface. 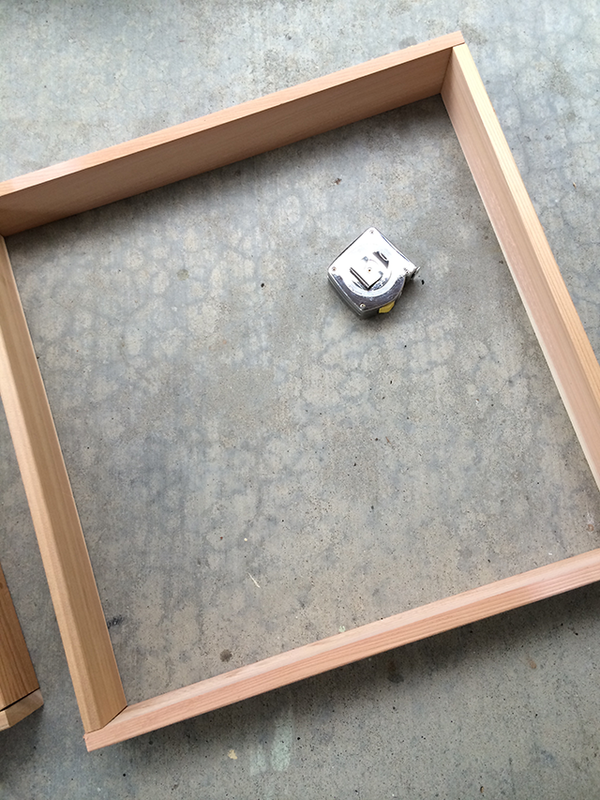 Arrange your 3 dowel rods on a flat surface. First lay down the 24 inch rod. Next, lay the 15 inch rod so that it overlaps. Finally, lap the 10 inch rod so that it also overlaps. It should look like an upside down triangle. 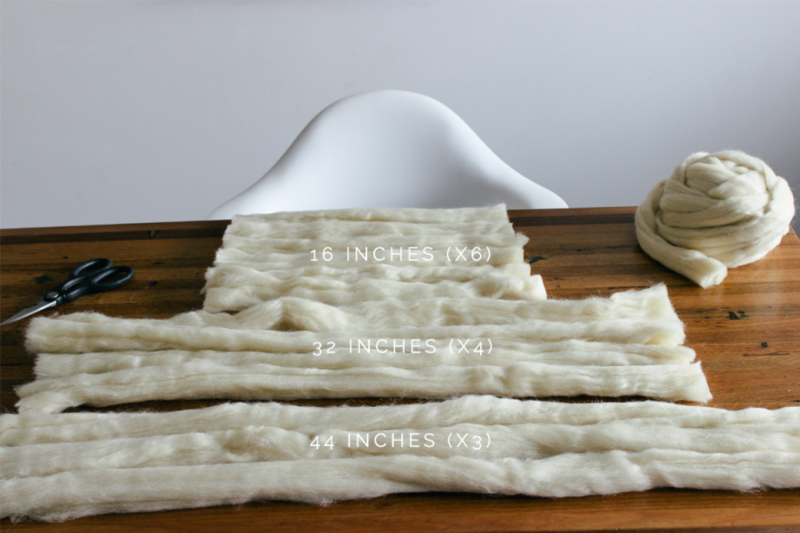 There should be about 9.5 inches from the bottom of one layer of wool to the bottom of the next layer of wool. 7 | Attach twine to ends of dowel rods. Place a ruler in the middle of your top rod so that it’s sticking out vertically. Before cutting the twine, tie twine to the left end of the top dowel rod. Pull the twine to the center so that it lines up with the 12 inch mark on the ruler. Now bring it over to the right end of the dowel rod. Cut and tie. Continue this process with each layer. Using the ruler will ensure that your layers all hang at the correct length. 8 | Hang and enjoy! You’ve basically made 3 separate little wall hangings that all hang together on 1 nail to create a unique piece of artwork. 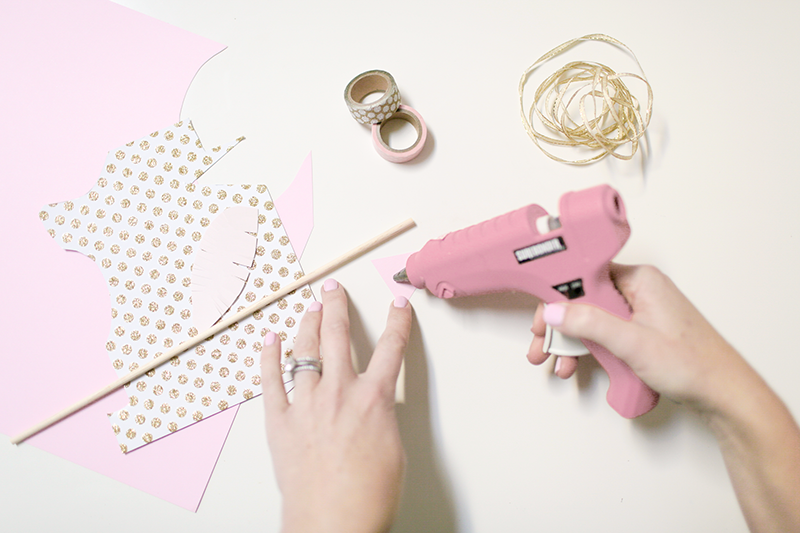 See all of our DIY posts here! Thanks for reading! With the holidays over and all of the Christmas decor packed away, I’m starting to slowly switch gears. The house felt like it was missing something once all the fun holiday decorations came done. So I’ve starting thinking about moving things around and restyling spaces. 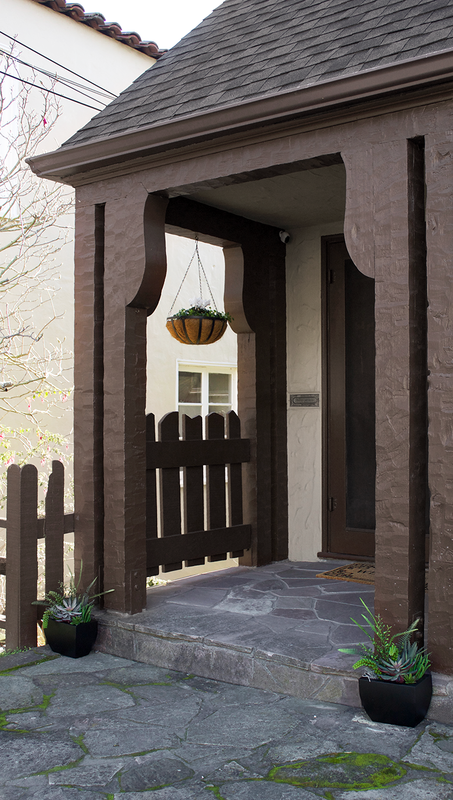 One easy place to start with is the front door area. First impressions and all right? It makes sense because having a clean and good looking entry really sets the tone. 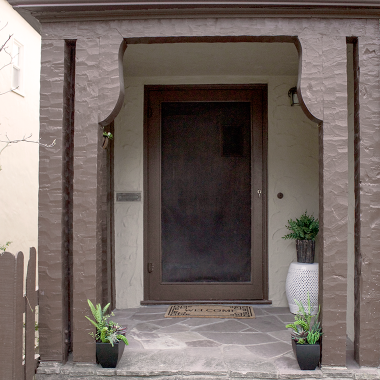 Well our doorway has been pretty neglected these days, so it was about time we paid it a little attention, don’t you think? I partnered with Kirkland’s because not only do they have amazing prices on pretty much everything, but their tagline is just perfect for this project: “Your Doorway to Home“. I knew they’d be able to help me out for this quickie revamp without doing too much damage to my wallet. Hi, I’m Kendall! 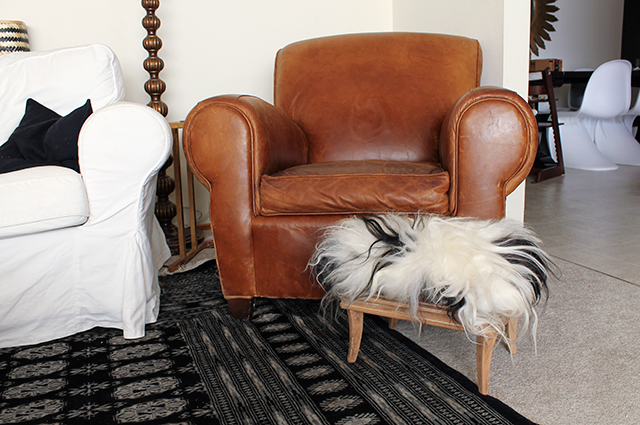 I’m a mom, teacher, decorator, DIY enthusiast, and lover of beautiful design. 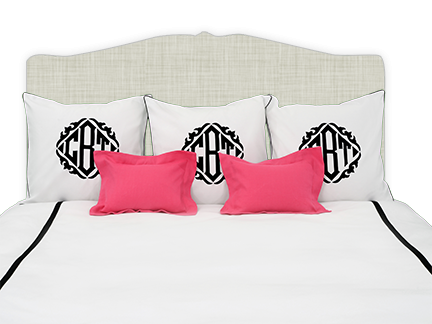 I recently launched my own design company, Kendall Wilson Design, in order to live what I love: creating charming yet sophisticated interiors and events. After planning and crafting for my own wedding nearly six years ago I knew I had to incorporate more creativity into my daily life, and now I’m finally doing just that. Connecting with Reichel to plan a Galentine’s Day Brunch was such a fun opportunity. 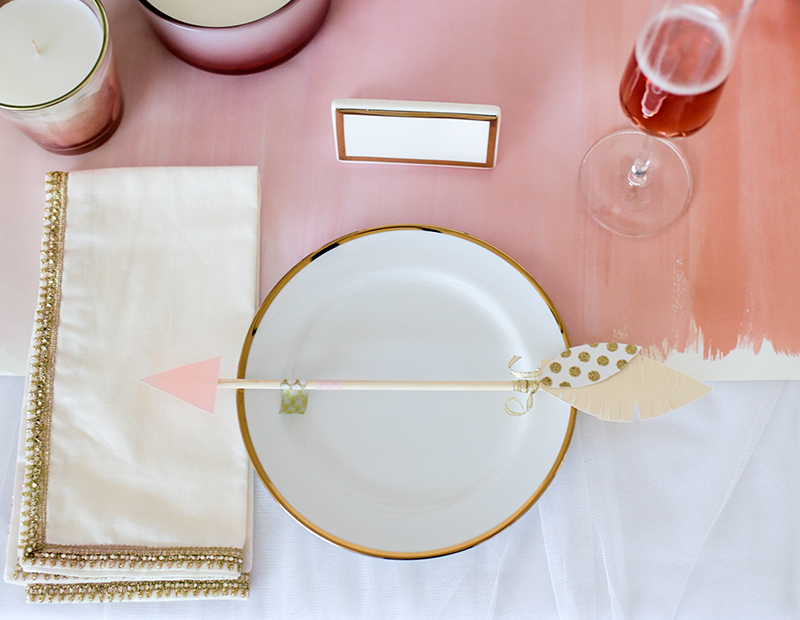 What’s better than a party with your gal pals who ogle over all of the pretty details? 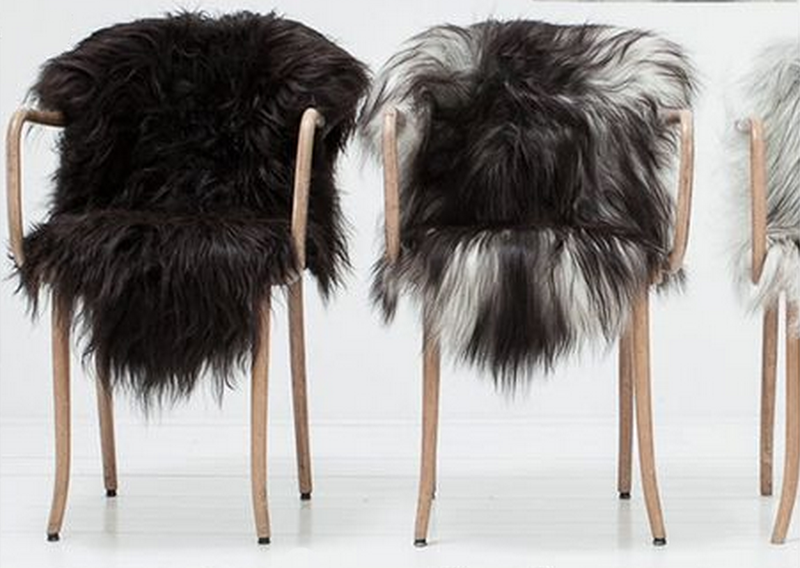 Just as every room needs a unique, statement piece, I believe every party needs some unexpected whimsy. Often crafting these elements yourself is the most satisfying way to accomplish this goal (and impress your guests!). I love the arrow motif for Valentine’s Day because it’s less expected than the typical hearts you tend to see everywhere this time of year. I figured out a simple and cheap way to bring hand-crafted arrows to our Galentine’s Day table. Enjoy! 1 | Decide on the color scheme for your arrows. 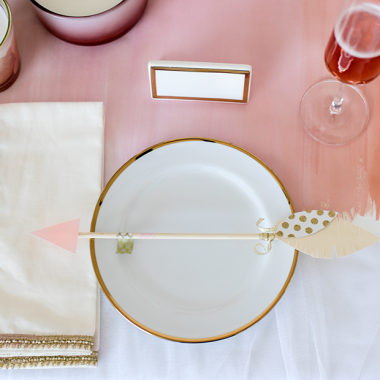 For this Galentine’s brunch I used a variety of blush tones with gold accents. You don’t need huge amounts, so whatever paper scraps you happen to have lying around are great. 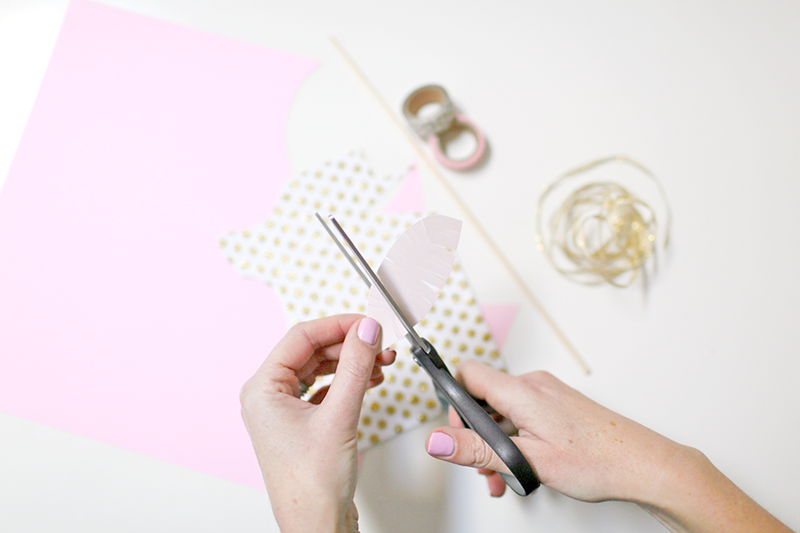 You just want your paper to be thick enough to hold its shape and stand up to a hot glue gun. Free paint swatches at your local hardware store are a great place to gather thick paper in a variety of colors. 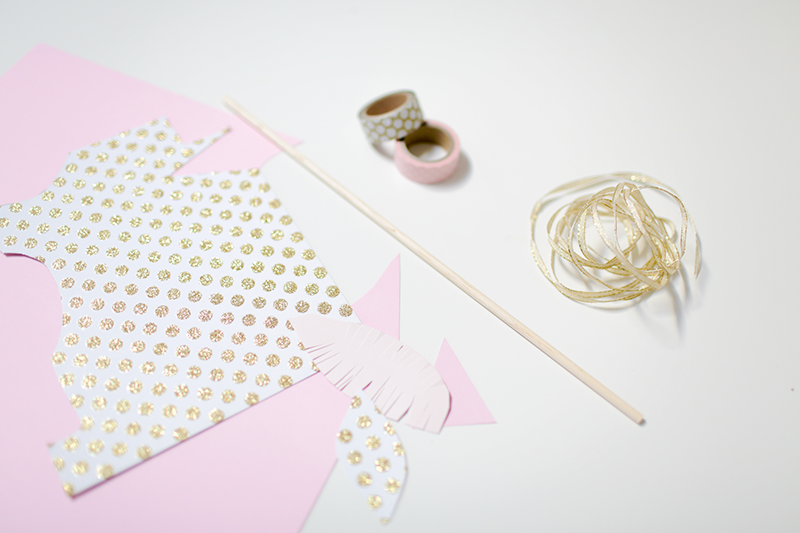 2 | Once you have your paper, cut out your arrowheads and feather tails. 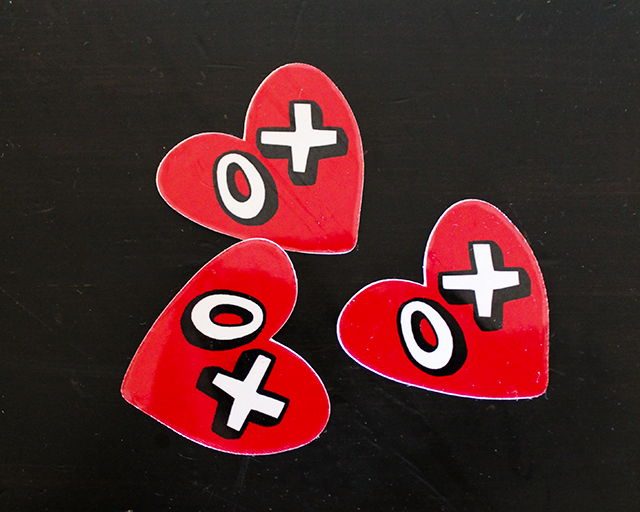 After you cut out your first set, you can use it as a stencil for the others. The arrowhead is a simple triangle, and the feathers are the shape of a slender leaf with fringe cut around the border. I like to cut the feathers free hand, so they are unique. For the fringe, don’t put too much thought into it, just dive in with your scissors! No need to be perfect. 3 | Now it’s time to assemble your arrows. A few simple lines of hot glue are all it takes. 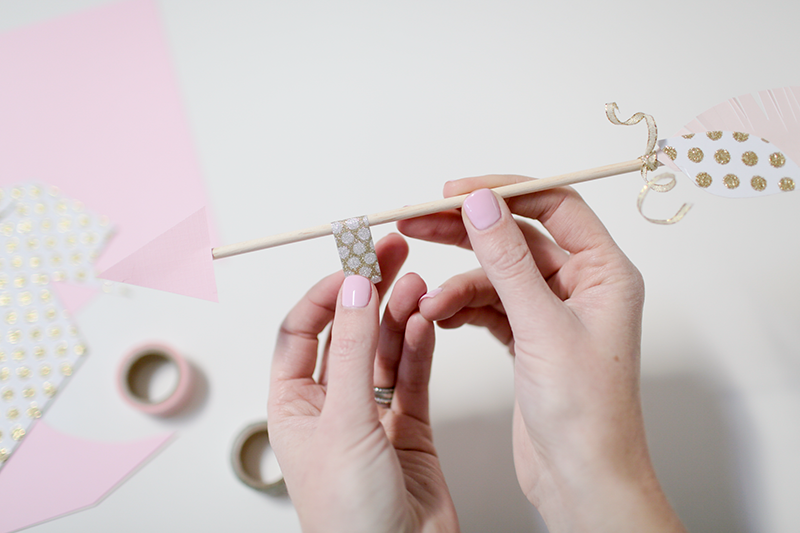 4 | To give extra flare to each arrow, it looks great to wrap parts of each wooden dowel with coordinating washi tape and/or ribbon. Here I wrapped the base of each arrow several times with narrow gold ribbon. I wrapped the ends of the wire ribbon around my finger a few times to give each arrow a little more character and dimension. 5 | And voila! 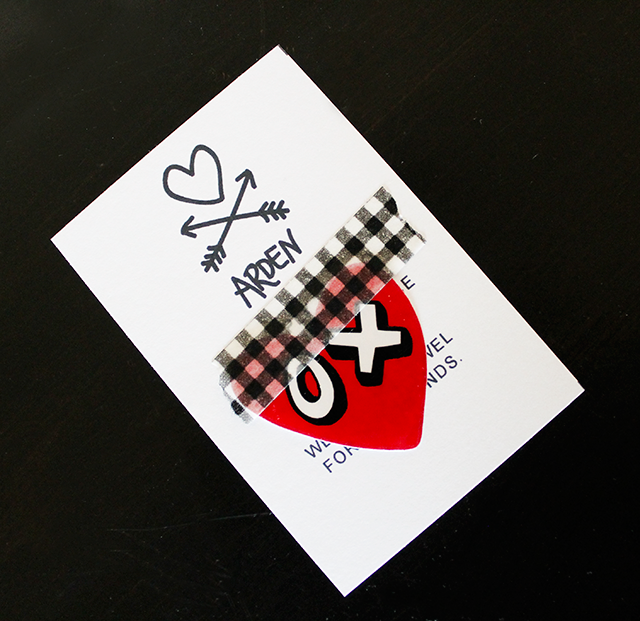 You can now send love on Cupid’s arrow to each of your favorite gals. These could be used as place cards, food cards, or simply unique table top decor like we did here. This post may contain affiliate links. 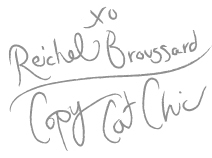 Thanks for supporting Copy Cat Chic. 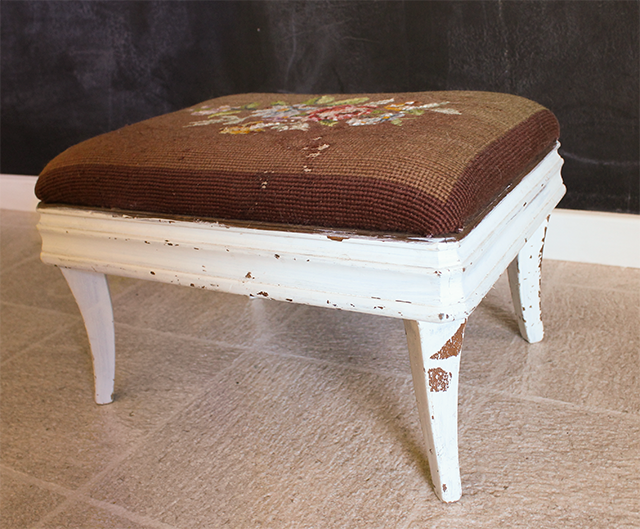 I picked up this vintage footstool last time I was at the Alameda Antique Fair and boy, did it need some help! Someone had decided to paint the base white, and they did a shoddy job to boot. I don’t think they even bothered to sand or prime, the just hastily slapped on some white paint and called it a day. 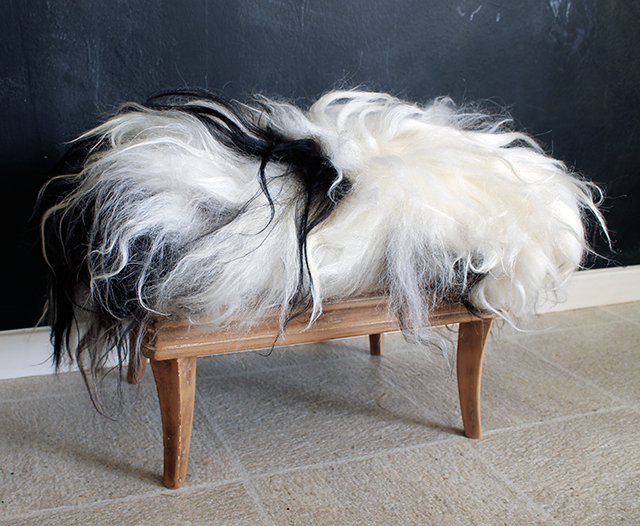 Unfortunately really, because this little stool has great bones, don’t you think? When I saw it I had a vision. So I picked it up for $10 and brought it home with me, cobwebs and all. So, first things first: A good sanding to get a smooth base for paint. 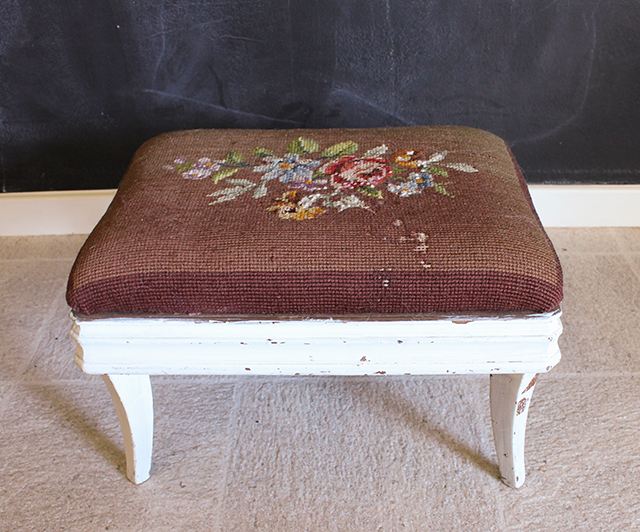 The last thing this little footstool needed was to see the outline of chipping paint underneath the fresh new paint I had planned. I like to use Valspar Gloss Paint and Primer in One for projects like these. I started with a 150 grit sandpaper block to get most of the paint off and then finished with 220 grit to smooth it out a bit. But an unexpected thing happened! 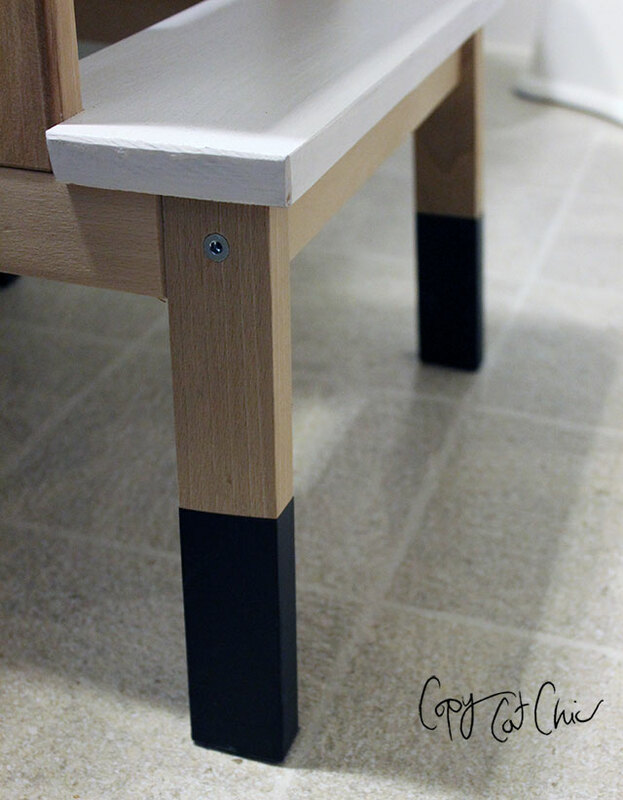 Once this little guy was sanded thoroughly….I absolutely loved the way the raw wood looked. 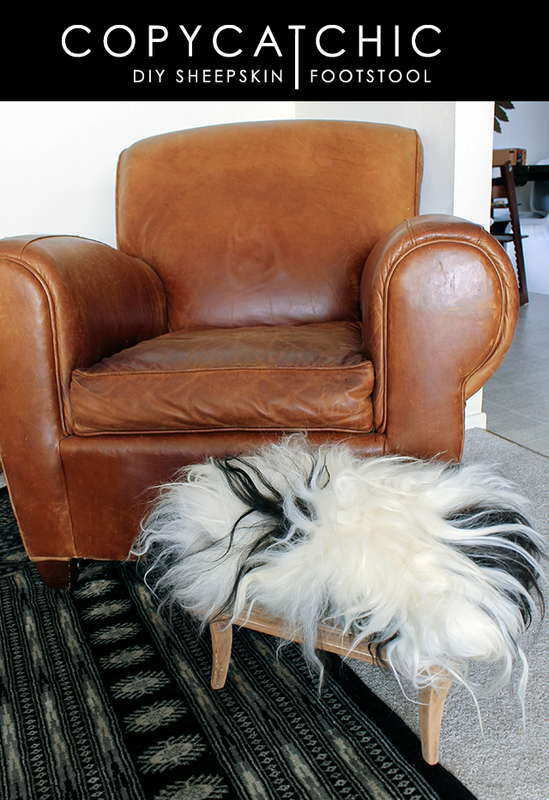 Aged and distressed without looking contrived and the perfect base for that fluff of fur I wanted on top. 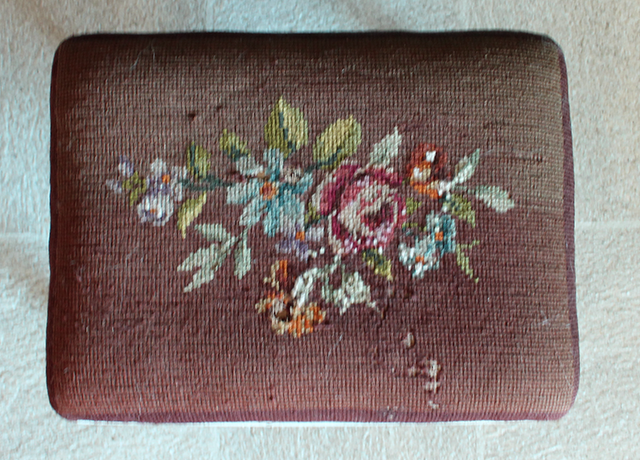 I kept the original needlepoint upholstery in tact and just recovered it with the sheepskin using a staple gun. So that’s my easier than expected furniture makeover! What do you think? Aren’t the legs great as they are? 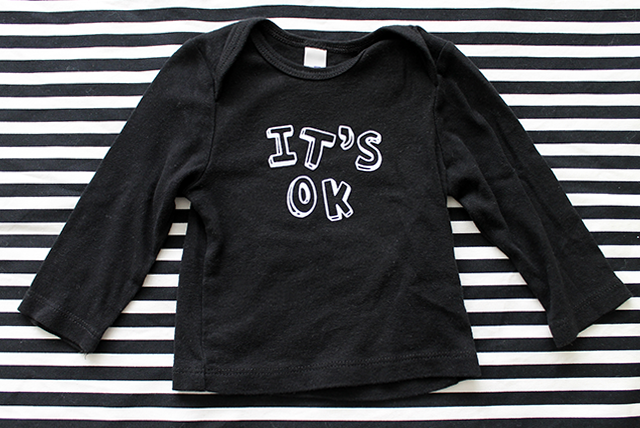 Handmade, small-production children’s clothing is so huge right now. 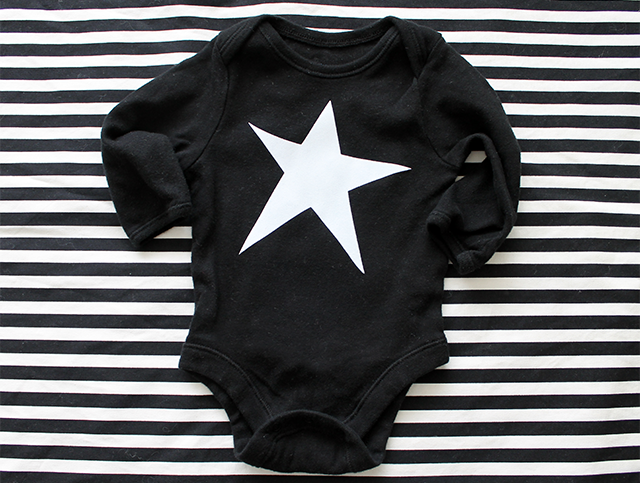 Parents are looking for good quality, unique and artistic clothing for their little ones. Who wants to wear the same thing as everyone else? Not I and why should my children, right? 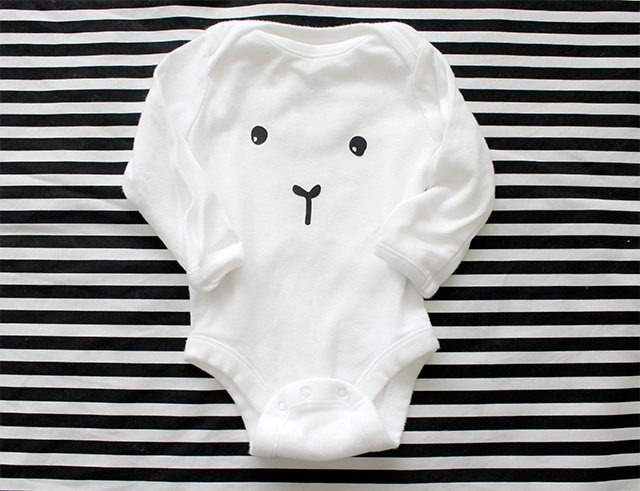 Well, paying $50 for a hand-drawn onesie just isn’t in my budget, that’s for sure. I understand why the prices are so high since it’s usually just one person Mama behind the wheel. Don’t get me wrong, I love supporting those independent makers, I just can’t afford them all of the time. So I figured I’d create some of my own using my beloved Silhouette Cameo and the Designer Edition Software (which lets me upload my own files for the Silhouette to use). 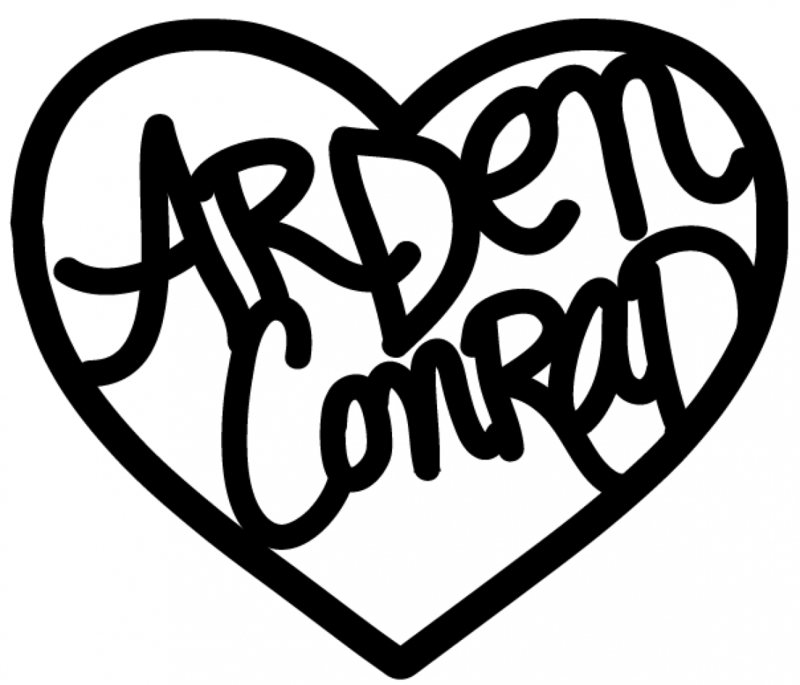 It’s been an era since I’ve drawn much of anything, but I put those rusty skills to use creating a couple of cute (and easy) designs to add to some of Conrad’s unadorned shirts and onesies. I thought they turned out adorable. 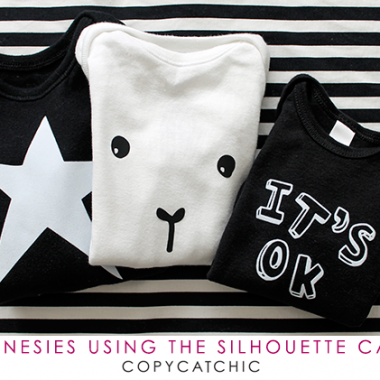 I loved creating custom shirts using my drawings and picking the colors I like (black and white) of course 😉 My mind is racing with other designs I can make! This onesie was inspired by my love of all things Nununu. I figured this would pair nicely with all of Conrad’s Nununu pants. This one was inspired by my love of Oeuf. Instead of a bunny, I thought this goat/llama was just as adorable. These two onesies are part of the Little Bundle line from Old Navy. They’re actually super soft and much nicer than Carter’s or Hanes. I thought this one was kind of fun too. Just a friendly little play on the “It’s OK” banners that are so hot right now. The shirt is from here. 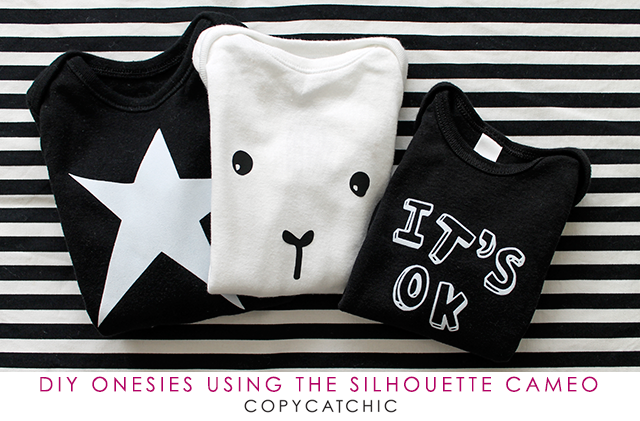 It’s hard to find shirts as opposed to onesies in the smaller sizes. It’s not quite as soft as the Old Navy onesies though. All Heat Transfer materials will be 30% off as well! Gorgeous shams like these ones from Leontine Linens. 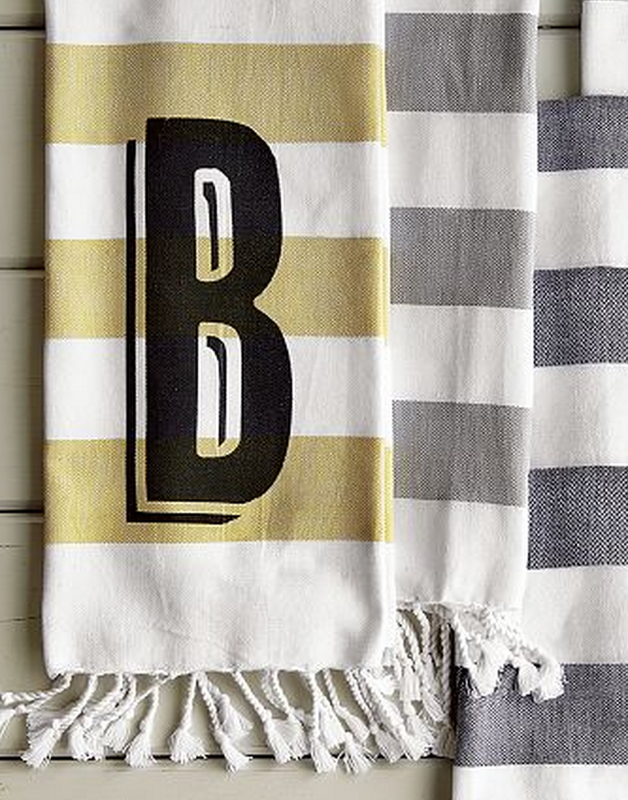 Monogrammed hand towels like these West Elm ones. 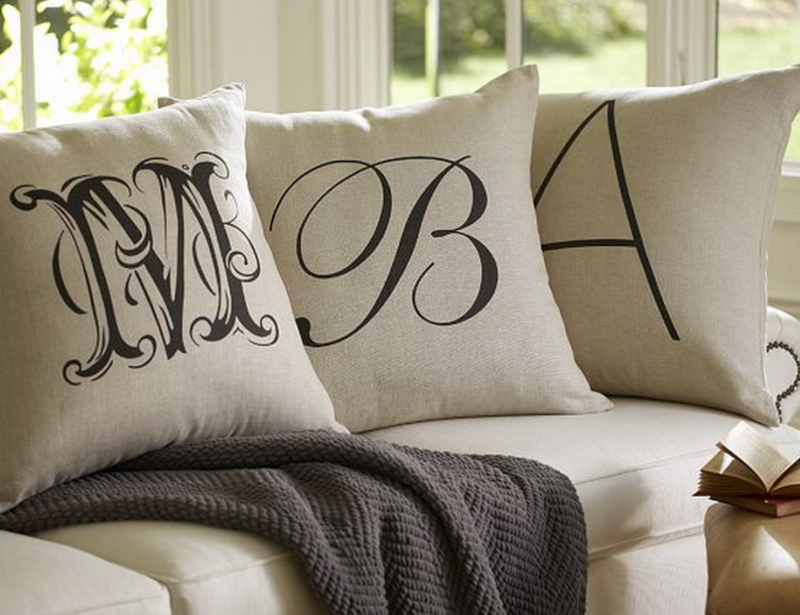 Or these fun throw pillows from Pottery Barn would be super easy. 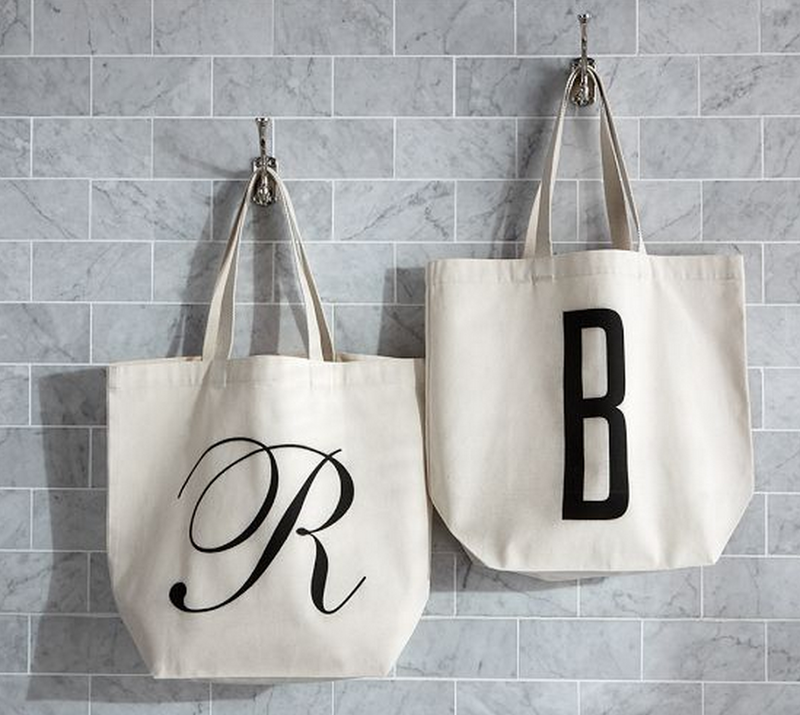 Or how about a personalized tote bag? Just a few of the many ways you can use these heat transfers. Have you guys used heat transfers before? What have you made? We had a gorgeous, sunny weekend here in the San Francisco bay area. It definitely feels like the warm weather is here to stay for awhile. The Mr and I were inspired to start thinking about our outdoor spaces. We started cleaning up the backyard and we put out the chaise cushions and umbrella. 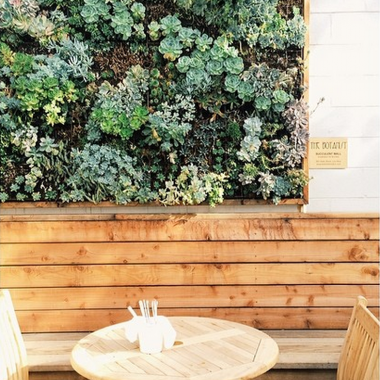 I’m going to do an patio update too…soon! But THIS month we decided to create some fun outdoor art to enjoy this summer. 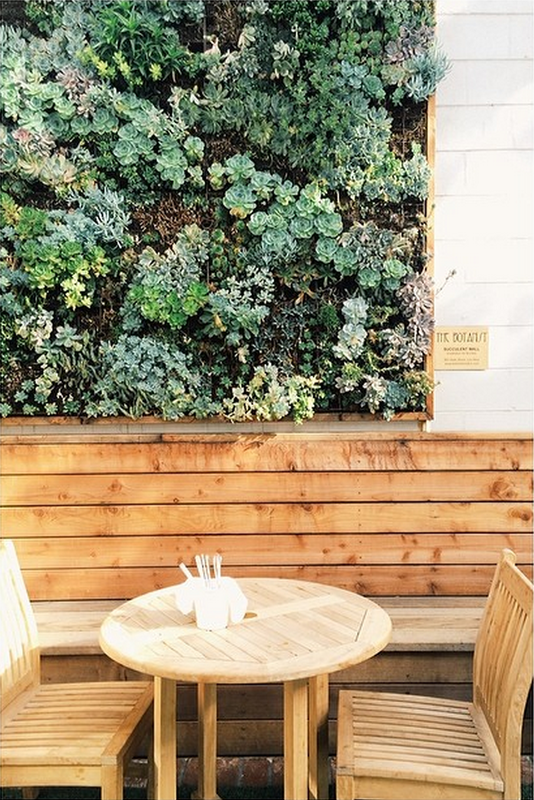 We decided to create a succulent wall. I took my inspiration from my favorite local cafe, Bumble. 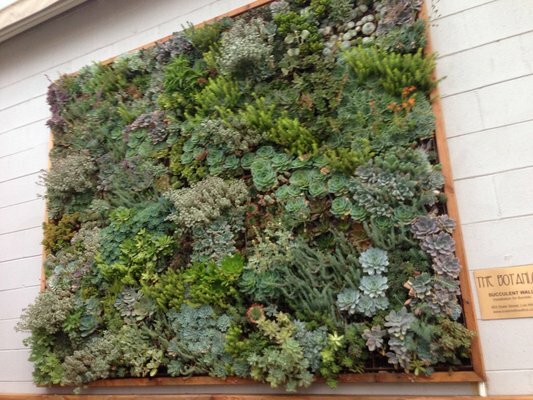 Bumble has the most amazing succulent wall created by The Botanist. 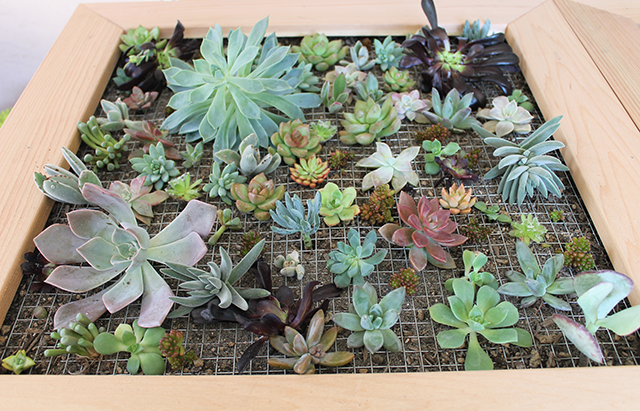 Of course we aren’t going for one on such a grand scale, I think Bumble’s succulent frame is the size of our backyard patio. Well, pretty close 😉 We decided to tackle doing two 2ft x 2ft succulent frames. We created, and when I saw “we” I mean, the Mr., a box from some left over cedar we had laying around from making our raised vegetable beds. The Mr. used his new Rockwell BladeRunner saw which made this all super easy. 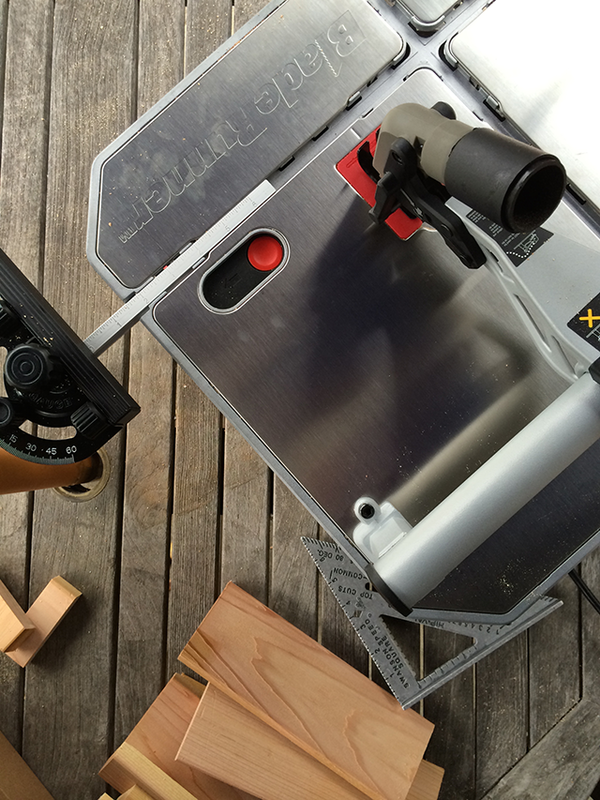 So excited about this new saw…I’m imagining all of the possibilities! 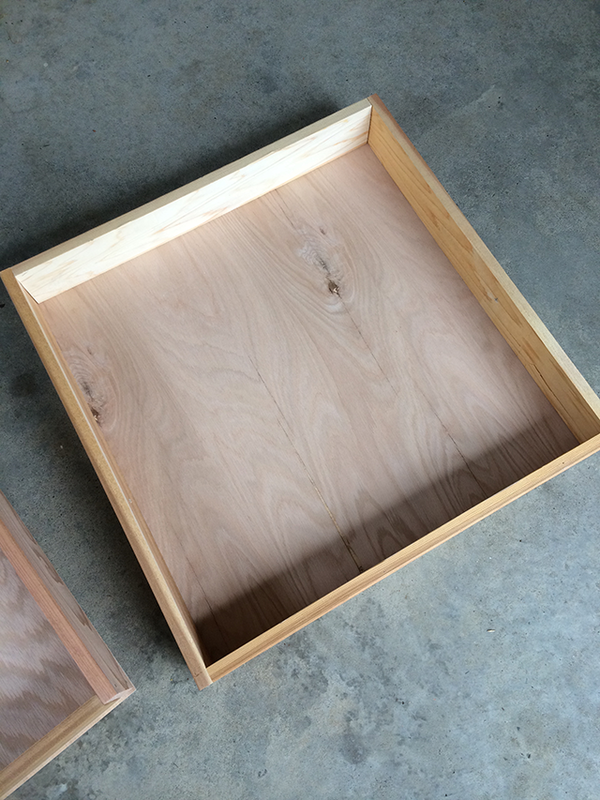 Next we attached plywood backings. 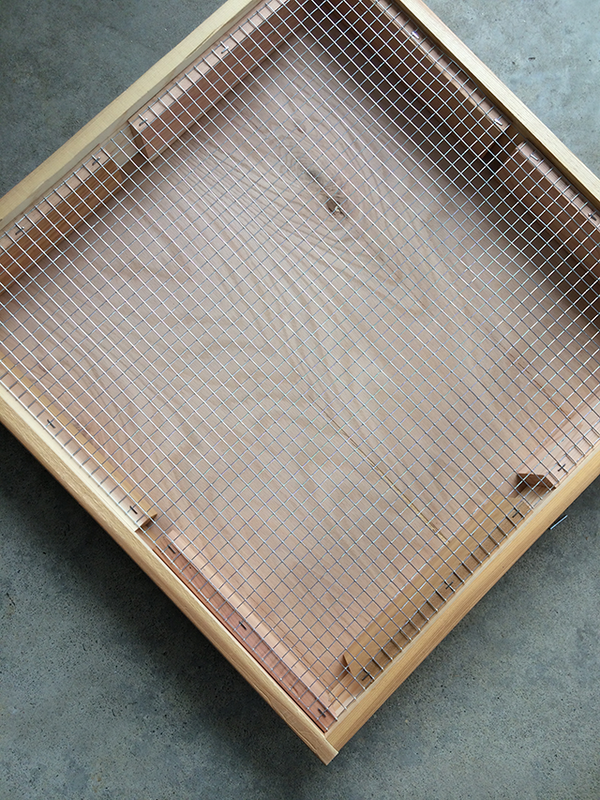 Then attached this wire netting with 1/2″ openings. 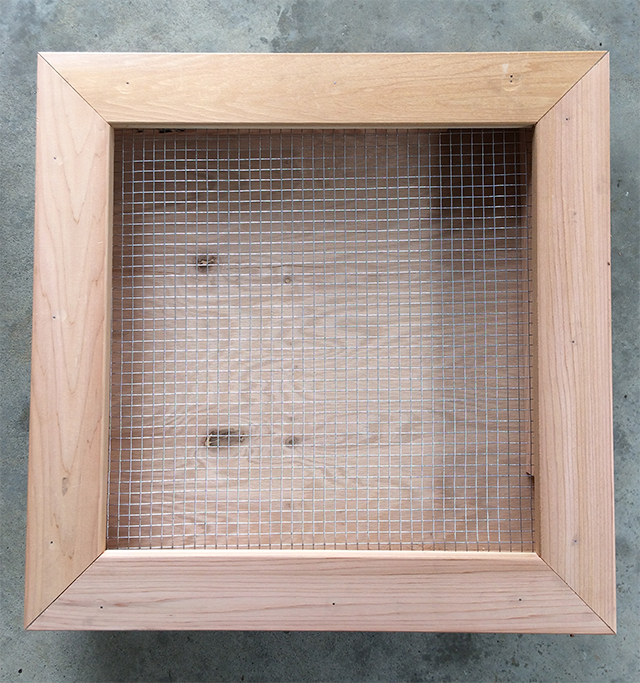 The Mr. inset pieces of wood and attached the wire netting to that with a staple gun. 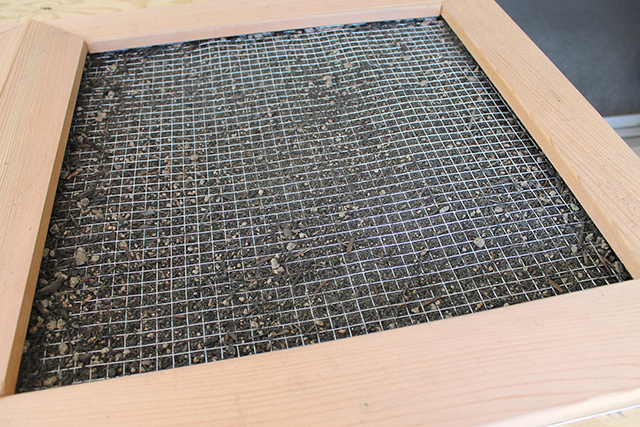 This way we can remove the wire netting later one without having to remove the frame face as well. Here it is with the frame attached. We used cactus soil in our base. 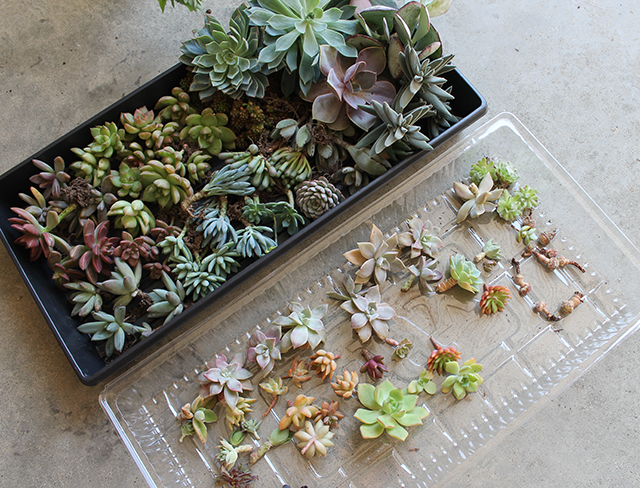 We bought a TON of succulents from Lowe’s, ranging from medium to small. Love all of the colors and textures. We removed them from all of their pots in preparation. Next I (and by “I” I mean me!) poked holes in the soil with a pen and inserted each little plant. As you can see there’s some gaps. I left them there on purpose, so that the succulents can have some room to grow. 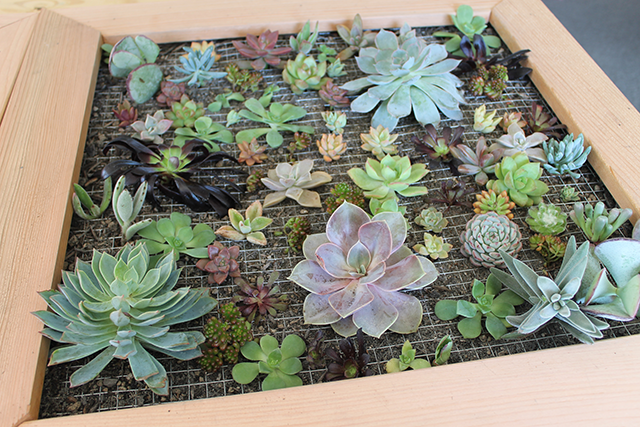 The succulents have to sit and grow roots for a few weeks before we can mount the frames to the wall. I also plan to add some moss to fill in the gaps and cover up the netting once we hang these beauts up. We are going to use french cleats to hang them in the backyard and I can’t wait! I’ll do another follow up post in a couple of weeks when they’re ready to be hung! This year instead of laying down a good chunk of change on Tattly’s I decided to put my Silhouette Cameo to good use. 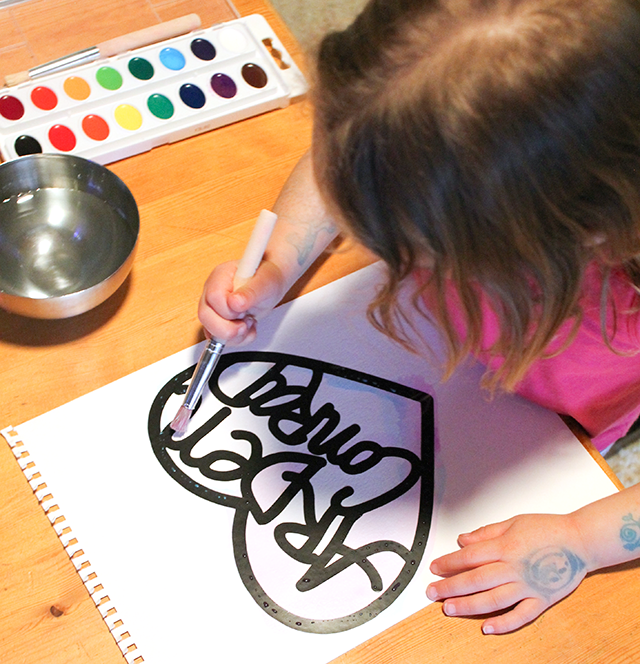 Did you know that you can buy temporary tattoo paper to create your own tattoos? Pretty awesome. I created a couple of tattoo designs in Adobe Illustrator and imported them using the Designer Edition Software which let’s you use your own designs with your Silhouette Cameo. By the way, Silhouette is having a great sale until Valentine’s day if you’re interested! Once I printed out the sheet of temporary tattoos on my home printer, I then entered it into my Cameo and it cut them all out for me, perfectly. So happy with they way they turned out! 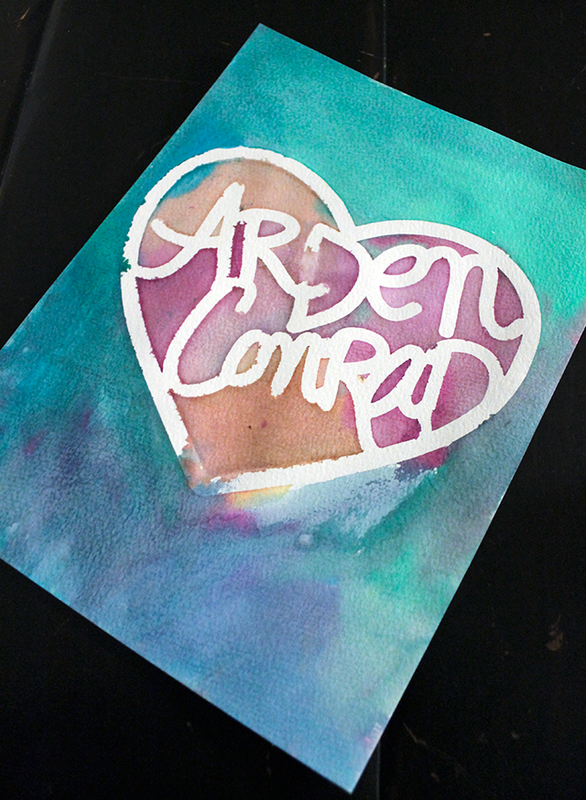 At Arden’s preschool they also asked all the PTA parents to either bring in a Valentine’s Day craft or treat. 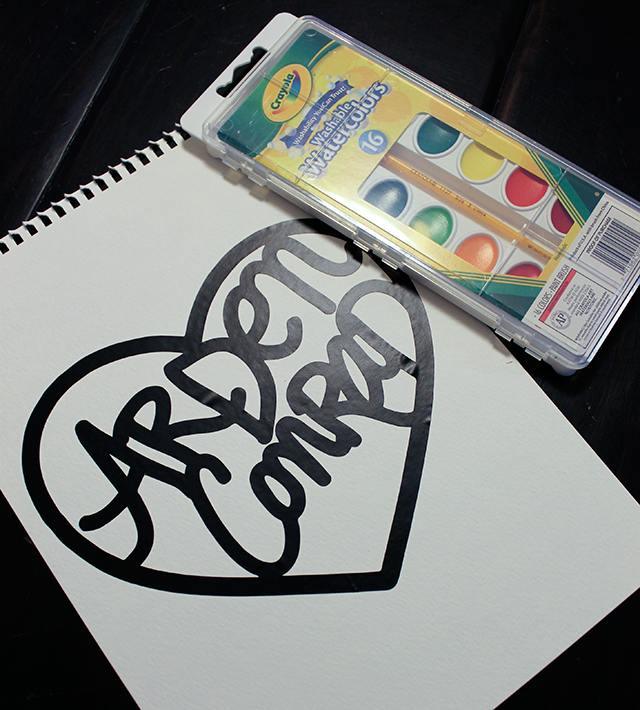 I figured I do some paint resist Valentine’s day cards, kind of like the watercolor painting we did last week. 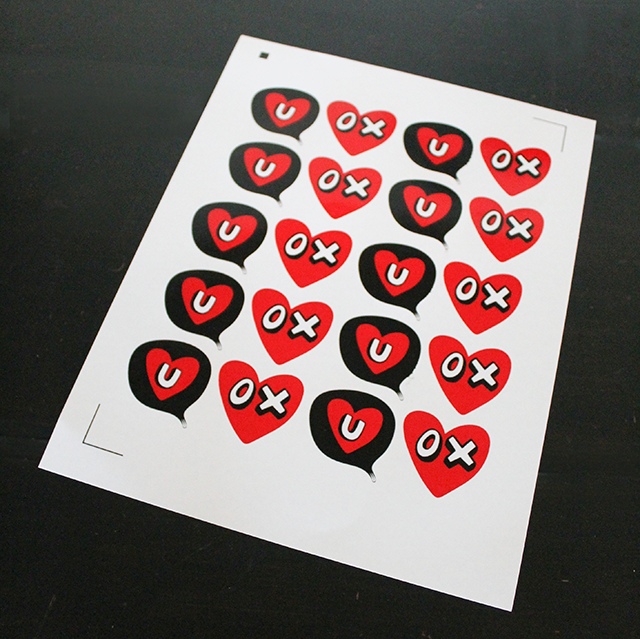 I printed out these love decals on my Silhouette Cameo as well and placed them on these blank cards for the kids to paint on and bring home. My Silhouette is getting some good use lately, right? To tell you the truth, I was a bit intimidated by it at first since I didn’t really know how to use it. But now that I’m using it more and more, I’m realizing how super easy it is. And it seems like I learn more about its’ capabilities every time I use it. *I wasn’t compensated for this post, but I was provided with the Designer Edition Software to use and review. The last time I posted about the Silhouette Cameo was when we updated the family room for the holidays with my DIY look for less rendition of Osborne & Little’s Coronata Star Wallpaper. Since then I’ve been busy brainstorming projects where I can use my Cameo. This little guy has SO many capabilities it blows my mind. I knew I had to put it to good use for Valentine’s Day. So I decided to create a fun piece of interactive artwork that we can display. I used the Silhouette Studio® Designer Edition Software to import a custom image that I created in Illustrator. The Designer Edition Software is different than the Studio Software that is included. The big difference? Well, there are a more few more options and the biggest option, in my opinion, is the capability to import your own artwork. SO key. First I created this design in Adobe Illustrator and saved it as a .svg file. And then I imported it into my library using the Designer Edition Software. 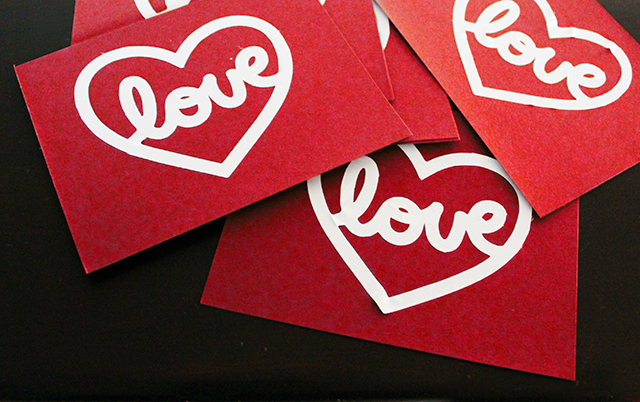 Using the “Cut Style” tool, I selected the “Cut” option, which created a cut line outlining the heart and letters. Then I simply sent it through to my Silhouette Cameo. I used black contact paper that I had lying around. Next I peeled off the contact paper and applied the custom decal onto a piece of nice cardstock. Then I had the resident artist, aka Arden, blow us all away with her water coloring skills. It turned out pretty fun, don’t you think? I can’t wait to frame it and hang it. *Although I was not compensated for this post, I was provided with the Silhouette Studio® Designer Edition Software to use for my project. The Ikea Bekvam stool is a toddler must-have. 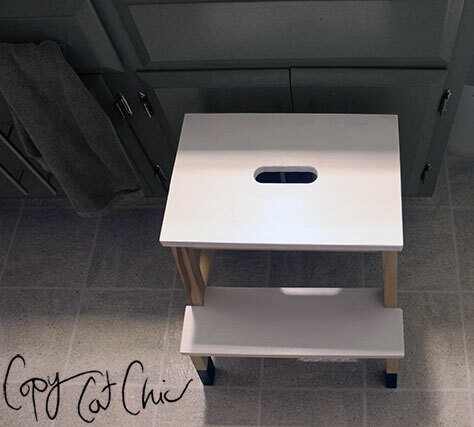 It’s the perfect sized, sturdy, little stool for tots to reach the sink, counter, light switch, closet clothes, etc. Arden has one in the front bathroom so she can reach the sink and wash her hands and brush her teeth. When we first updated the front bath, I just painted part of the legs black. We’ve done a couple of more little updates to the stool since then. 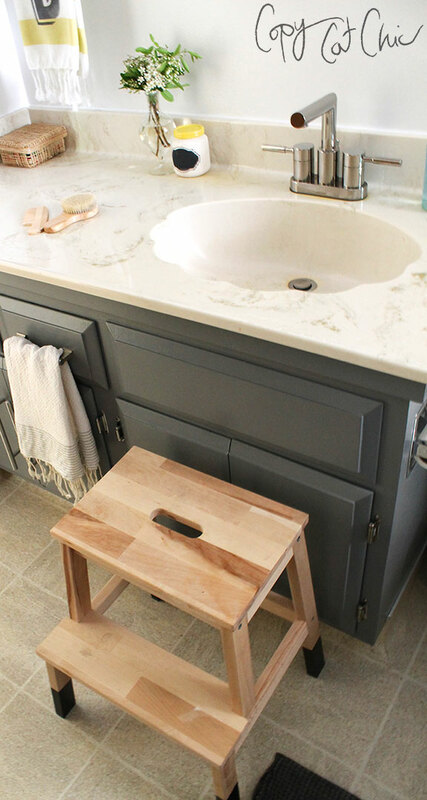 Issue number One: When I posted the front bath update post a reader commented asking how we kept the stool from sliding around. 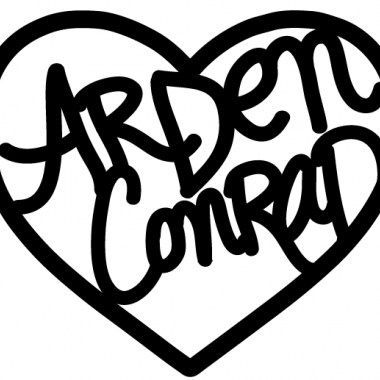 At first we didn’t have a problem with that, but after some creative maneuvering on Arden’s end…we did. And for an easy solution? 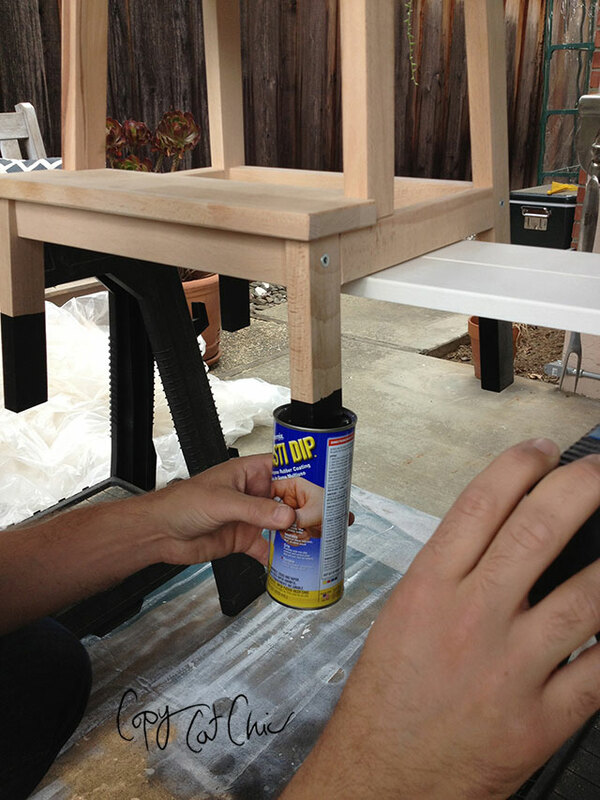 I picked up some Plasti Dip in black from Lowe’s and the Mr. literally dipped the legs right into the can. Voila! No more slippage. 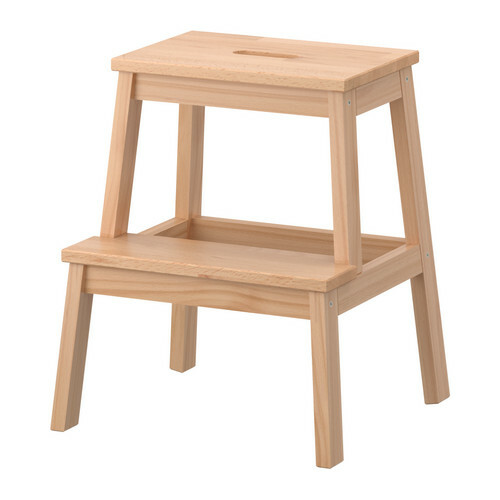 Issue number two: The unfinished wood of the stool was kept getting stained from water and dirt. Not the prettiest sight to see. So a little more painting was in order. I used Valspar No VOC paint and primer in one in a semigloss white. It worked like a charm; water doesn’t seep into the unfinished wood and dirt stains wipe right up. Problem solved. And I think it looks cuter too! 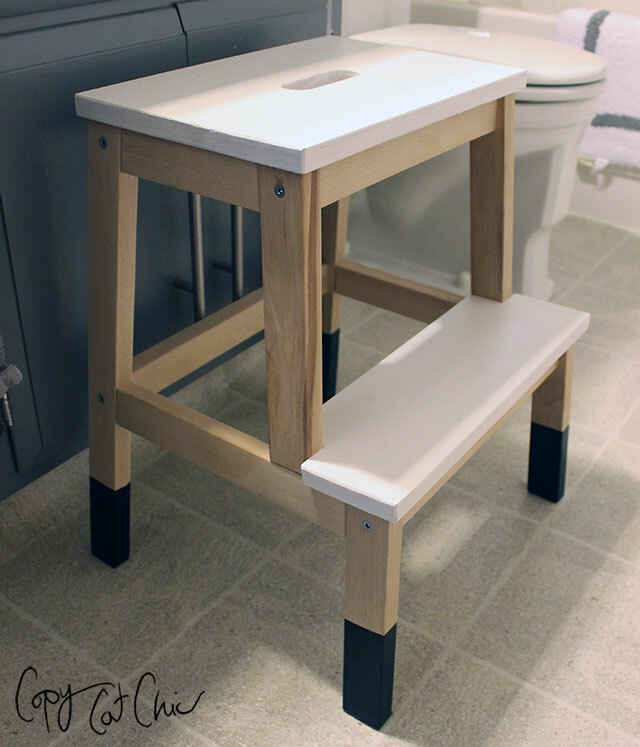 This post was brought to you in part by the Lowe’s Creative Ideas Network, which I’m so happy to be a part of along with a crew of other really creative bloggers, you can check out all of our fun projects on the Lowe’s Creative Ideas Blog. As a part of the LCI Network, I’ve received compensation in the form of Lowe’s credit to help with my projects above.